One of the major challenges in the world today is the energy crisis. The high demand and low supply of fossil fuel are driving up oil and food prices. Silicon-based solar cells are one of the most promising technologies for generating clean and renewable energy. Using these devices to convert just a fraction of the sunlight that hits the earth each day into electricity could drastically cut societys dependence on fossil fuels. Unfortunately, however, high-grade silicon crystals demand great care during the manufacturing process, making the resulting high production cost one of the main obstacles in the road to commercialization. One way to bring down the production cost of these solar cells is to deposit layers of silicon onto cheaper substrates such as plastic or glass. 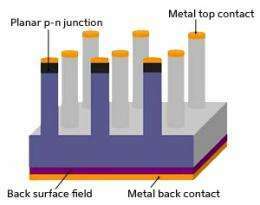 However, this approach has one drawback: silicon thin films have lower power conversion efficiencies than bulk silicon crystals because they absorb less light and contain more defects. Patrick Lo at the A*STAR Institute of Microelectronics and co-workers have now discovered an approach for increasing the power conversion efficiency of silicon thin films deposited on cheap substrates. Low-grade silicon thin films suffer from one inherent problem: they cannot absorb photons whose wavelengths are larger than their film thickness. For instance, a standard, 800-nm-thick thin film may capture short-wavelength blue light, but will completely miss longer-wavelength red light. To keep material costs low and improve light efficiency, the trick is to trap more photons, including those with medium wavelengths, says Lo. Lo and co-workers used computer simulations to determine the best configuration for extracting electrical charges from the defect-ridden silicon films. They found that the upper portion of each pillar can be made extremely conductive by introducing large amounts of dopants. Lo and co-workers are now using these practical guidelines to engineer a prototype of this unique concept. Working with nanostructures is a wonderful way to open paths that could overcome the limits set by conventional physics, he notes. "significantly boost the power conversion"
"Unfortunately, however, high-grade silicon crystals demand great care during the manufacturing process, making the resulting high production cost one of the main obstacles in the road to commercialization." Not just great care, but great amount of energy to create a polycrystalline panel. I don't know the stats today, but a typical panel from several years ago took more energy to create and deploy than it was expected to "make" in its lifetime. So what's the energy "return on investment" today?